How can i make it so my autoresponder email is aligned to the left and not to the center? I've set every rows/columns table properties to align 'Left' and still no luck. To make changes to the Email template, please follow the below steps. 1. Go to Settings in the Form Builder and select Email on the left nav. 2. Select the Autoresponder and click on the edit icon. 3. 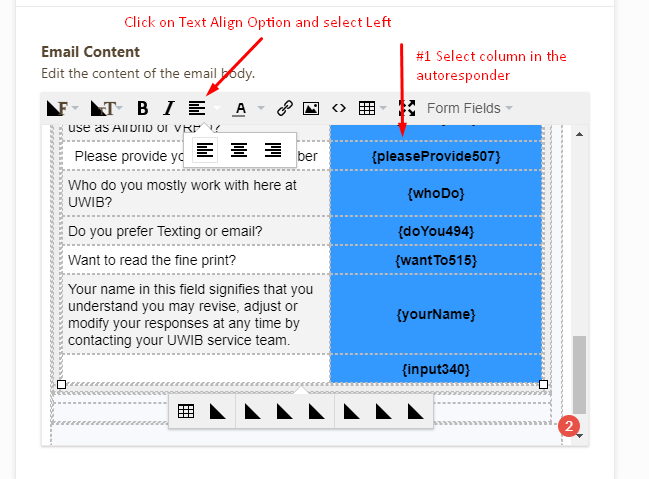 Go to email content, select table column and choose the text alignment option. 4. Do not forget to click SAVE at the bottom.